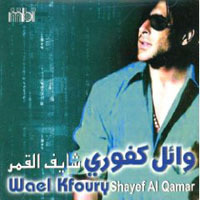 This page contains a translation into English of the lyrics to the popular song "Maghroora", sometimes spelled "Maghroura", which was sung by Wael Kfouri. Also included is a transliteration of the Arabic lyrics into the Roman alphabet so you can sing along if you like. Maghroora sarlake middai For a while you have been arrogant. Ibhakeeki ma bitriddi. I talk to you and you don't answer. Maghroora sarlake middai. For a while you have been arrogant. Inseeti ilbayt ibras iljird, ya malyaanai talj iw bard. You forgot the house on the dirt hill full of snow and cold. Ya malyanai talj iw bard. Full of snow and cold. Is-hirti iw dhallayti 3andi. We stayed all night long and you stayed with me. Ibhakeeki iwma bitriddi. I talk to you and you don't answer. Inseeti ilbayt ibras iljird, ya malyaanai talj iw bard You forgot the house on the dirt hill full of snow and cold. Da, Da, Da, Da, Da, Da, Da, Da, Da, Da, Da, Da, Da. Da, Da, Da, Da, Da, Da, Da, Da, Da, Da, Da, Da, Da. Tallaiti ilhay2a bakeer, shifti haalake sabiyai mahdhoomai iw 3ayyoo2a ikteer batalti itridi 3alayyi. It seems that You showed up early, you thought of yourself as a young lady acceptable and smart and shifty and you stopped answering me. Inseeti iljird iw fayyatow iw kano ibkhadake wardatow. You forgot the dirt hill and its shades that were rosesin your cheeks. Saar ilbahr ibshamsatake yimhi lawn il maawardi. The sea with your sun lights erased the rosy color. Inseeti ilbait ibras iljird. You forgot the house on the dirt hill. Ya malyaani talj iw bard. Full of snow and cold. Ya malyani talj iw bard. Full of snow and cold. Is-hirti iw dhalaiyti 3andi. We stayed all night long and you stayed with me. Ibhakeeki iwma bitriddi I talk to you and you don't answer. Da, Da, Da, Da, Da, Da, Da, Da, Da, Da, Da, Da, Da, Da, Da, Da. Da, Da, Da, Da, Da, Da, Da, Da, Da, Da, Da, Da, Da, Da, Da, Da. Ilha2 3alayki la itkhabi, inti inkarti ilhobi Illi Kaan. Fikrake titsalli ib albi wihyatake albake ghaltan. It is on you that you should not hide that you denied the love we had. You thought it is a joke to play with my heart. I sware by your life that your heart is mistaken. Insseti ilhobbi, inseeti ilwa3d iw addaysh frashtilake ward. You forgot the love, you forgot the promise and how many times I spread roses for you. Roohi iw halmarra 3an jadd. Rah illake battal Baddi. Go away, and this time for sure I will tell you I am quitting. Inseeti ilbait ibras iljird, ya malyaanai talj iw bard. You forgot the house on the dirt hill full of snow and cold. Ya malyaanai talj iw bard. Full of snow and cold. Is-hirti iw dhalaiti 3indi. We stayed all night long and you stayed with me. Maghroora sarlake middai, ibhakeeki iwma bitriddi. For a while you have been arrogant. I talk to you and you don't answer. Inseeti ilbayt ibras iljird. You forgot the house on the dirt hill. Is-hirti iw dhalayti 3andi. We stayed all night long and you stayed with me.